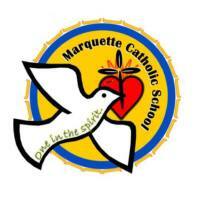 Marquette Catholic School (MCS) provides a comprehensive and relevant curriculum for each student. MCS is accredited by Minnesota Nonpublic School Accrediting Association (MNSAA). We follow the educational guidelines of the Catholic Diocese of Duluth and the Minnesota Department of Education. The basic curriculum includes instruction in the following subjects: Religion, Reading, Writing, Spelling, Math, English, Social Studies and Science. Additional instruction is provided in the areas of Music, Art, Computer Technology, and Physical Education. Students visit the library weekly. Small class sizes ensure our students are given the individual attention they deserve. Our faculty recognizes and respects the different learning styles of its students. We believe learning is an ongoing process in which each child’s unique gifts are recognized. Each week a class is responsible for preparing the liturgy for the entire school. Parents are encouraged to attend these services. Special liturgical feast days and prayer services are celebrated during the year.